Pre-cutting the fabrics is a mandatory requirement prior to taking this course. Please begin preparing for class at least 2-WEEKS prior to the class to make sure that you are able to get familiar with your pattern and complete the pre-cutting beforehand. We always recommend reading through your entire pattern several times before beginning. Correction: Please take a minute to read the Correction Sheets provided by Quiltworx for the Arizona Cactus Table Topper. These sheet can be found on my CPQ website with my pre-class instructions or on the Quiltworx website (www.quiltworx.com) under the Patterns page for this specific pattern. Fabric Selection: Please refer to the yardage chart on the back of your pattern for the required fabric amounts. Color assignments are shown on page 11 of your pattern. Preparing your Foundation Papers: Please read and follow the instructions for ‘Foundation Papers, Templates and Template Layout Sheets” at the end of page 1/beginning of page two of your pattern. NOTE: PLEASE PAY SPECIAL ATTENTION THAT YOU DO NOT CONFUSE FOUNDATION PAPERS WITH TEMPLATE LAYOUT SHEETS. Foundation Papers: These are the foundations that you will sew the fabric directly onto. These need to be trimmed leaving a 1/8” border. DO NOT cut the individual units apart. Template Layout Sheets: The template layout sheets are used to cut your fabric. You will cut through these templates when you cut certain parts of your fabric. These need to be trimmed leaving a 1/16” border and used per the directions in the pattern. Marking “Fabric Guide Lines” on Foundation Papers: This step helps you to locate the actual area that your fabric needs to cover before adding your fabrics. It takes a few minutes to complete this step, but it saves a lot of time when you don’t have to rip out seams when fabric has been miss-placed during the sewing process. The easiest way to mark your “guide lines” is by folding or creasing the foundation papers on the DASHED LINES. Use your Fold Template (referenced below in the supply list) and place the edge along each of the dashed lines on the front side and finger-crease down the line. The lines are numbered 1,2,3… When you turn the foundation paper over you will see the fabric areas clearly marked on the backside. Another way to accomplish this is to use a light-box or a window to trace the DASHED LINES with a ruler and pencil. Cutting Instructions: Follow the Cutting instructions on page 2, 3, 4 & 5 of your pattern. Place fabrics into the bags specified in the cutting instructions. You may want to check out the following sites prior to selecting fabrics. There are many samples, slide shows and color-changing quilts available for you to enjoy. There are also corrections and helpful hints posted for most of the patterns that have been published on the Quiltworx site. If you have questions, please feel free to contact me. 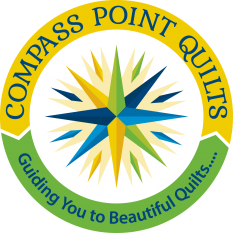 I can be reached at compasspointquilts@gmail.com. Please indicate the workshop/class you are signed up for and the pattern you are working on.